Glass cleaners are a dime a dozen in department stores all over Canada but picking a product is less than half of the battle. When you are attempting to get your windows looking shiny and new – call in the pros. It only takes one call to have your Steinbach window cleaning done properly, quickly and effectively. Using a glass cleaner and paper towels might be a temporary fix indoors but these methods are not effective outside. Using the wrong products on the exterior of your home can render the practice useless. In order to bring our customers the best results possible, our Gorillas use eco-friendly products as well as top of the line tools. Our Steinbach window cleaning service can be tailored to fit the needs of your property. Gorillas use either water fed poles to reach higher windows or by hand with a rubber squeegee. No matter which tools we are using, Gorilla technicians are sure to get a complete clean for your windows. 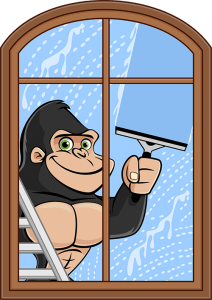 Corners and frame lines are easy to miss when you are cleaning windows – but not for our Gorillas. The glass portion of your windows is the most obvious when it comes time for cleaning. Even though it is the most obvious, the glass is not the only part of your window that benefits from some TLC. Our Steinbach window cleaning service includes window frames and sills in addition to the glass. This allows technicians to monitor deterioration around the surfaces of your property. Having a clear view of trouble areas can provide insight into necessary upcoming repairs.